Man who attacked 22-year-old Levi Rosenblat outside the Chabad center in Brooklyn reportedly had history of mental illness. 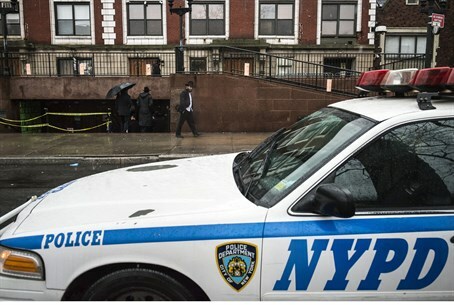 Police in New York do not believe that Tuesday’s stabbing outside the Chabad-Lubavitch building in Brooklyn was terror-related, The Associated Press (AP) reports. The attack occurred around 1:40 a.m. Eastern time on Tuesday morning, when the stabber, identified as 49-year-old Calvin Peters, attacked on 22-year-old Levi Rosenblat, wounding him in the side of the head. Peters could be seen on amateur video waving the knife inside the Chabad-Lubavitch headquarters in Crown Heights after the stabbing. He was subsequently shot dead by police forces who arrived on the scene. The stabbing shook the Jewish community, still reeling over an attack on a Jerusalem synagogue last month that left four worshippers and an officer dead. "The entire Jewish community is impacted by these cruel and senseless attacks," said New York state Assemblyman Dov Hikind, according to AP. "How can we help but be reminded of the recent, horrible tragedy ... which left five innocent people dead?" Police were still interviewing witnesses but quoted Peters as saying instead, "I'm going to kill all of you." The case was not immediately classified as a possible bias crime. Peters had wandered into the building earlier Monday and was ushered out, then returned after midnight and asked, "Do you have any books in English?" before he was escorted out again, police said. Chabad-Lubavitch officials said security at the building was tightened after the stabbing. They would not say what measures were in place at the time of the attack.